Centuries ago, a group of Aranken mages left their homeland and became the ancestors of the Nikari. Now a Nikari prince will return, seeking truth and finding far more than he expected. Shuri Fezenda has one goal in mind when he departs for A’rankin—to identify the culprit behind the conspiracy targeting Ivy, his brother’s consort and a man Shuri cares for deeply. But when he meets Prince Tynare’Or’Therar, Shuri’s world is turned upside down. Beautiful and mysterious, Tynare draws Shuri like no other. The secrets he whispers taunt and tease, but Shuri’s treacherous heart races and his body responds when Tynare shoots him a knowing smile. And then Shuri meets Tynare’s twin brother, Nari, and in Nari’s kindness and blind eyes, he finds refuge and a love beyond anything he thought he could feel. Torn between duty and confused emotions, Shuri faces an A’rankin on the brink of civil war and a foe he didn’t count on—the neighboring land of Shyrn. At the heart of the conflict, one question remains. Who is Tynare really, and who is Nari? Shuri is almost afraid to learn the answer. Huh. It was an okay read, but there were too many WTF moments. Moments when things didn’t make sense that the character’ logic was no where to be found. Book two centers on Shuri, the emperor’s half brother. I don’t get why he liked Ivy, his brother’s consort, so much. They really haven’t spent too much time with each other in the other book, so his love wasn’t convincing to me. Don’t tell me the character is in love, show it to me. Write the scenes to convince me. ALANA ANKH is a hopeless romantic. Once upon a time—no, not in the Stone Ages, but when Alana was a nosy teenager—she lived and breathed mainstream romance, but after she discovered m/m…. Well, her fate was sealed. Regardless of the genre, Alana thinks love can be painful, heartbreaking, but also fun, corny, and a little silly. Love is different for everyone and anyone—and in her books, she tries to celebrate that. 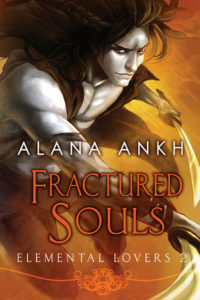 Alana also loves sci-fi, fantasy and paranormal. But even if her boys have scales, fur, claws, fangs—or whatever else occurs to her—they’re really very nice people. Most of the time. Well…. Most of them are nice, but all of them deserve love and a HEA. When Alana isn’t feeding her addiction to happily-ever-afters and hot men, she’s randomly slaying monsters in MMORPGs or thinking up the next idea to share with readers.